Triple Chocolate Dipped Pretzels is rated 5.0 out of 5 by 1. Rated 5 out of 5 by Jazzbo from Yum yum! I bought these for my husband's birthday & had them delivered to his job. He shared them with his team. They were gone in half an hour. 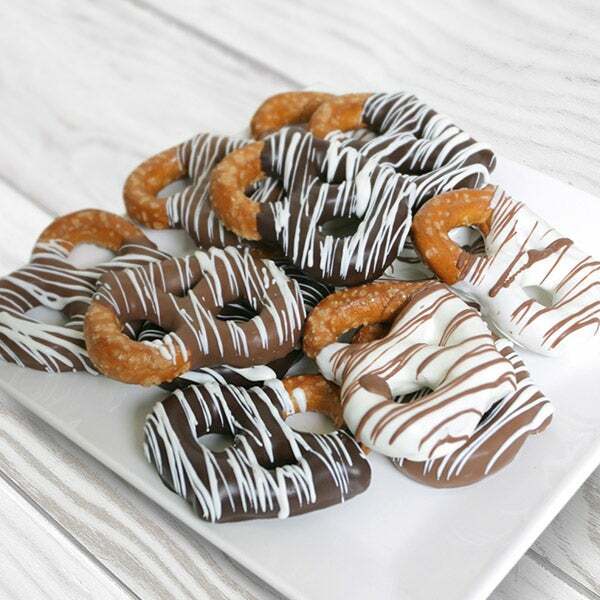 The perfect combination of sweet and salty tastes, these thick, plump pretzels are lightly salted, dipped by hand into pure white, milk, and dark Belgian chocolates, then elegantly decorated with ribbons of silken chocolate confection to create a completely irresistible treat.